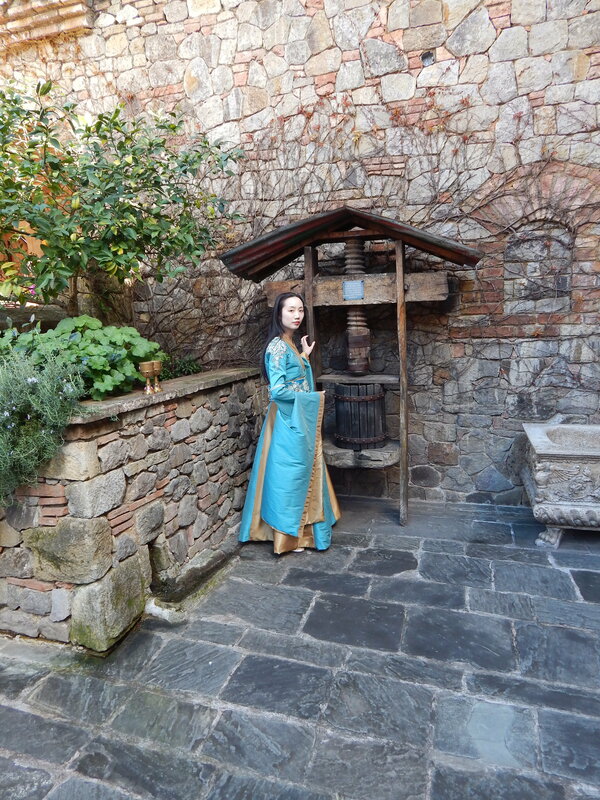 This weekend I went to a wine tasting event at the Castello di Amorosa in Calistoga, CA. The theme was Game of Thrones, and there were many lovely costumes! 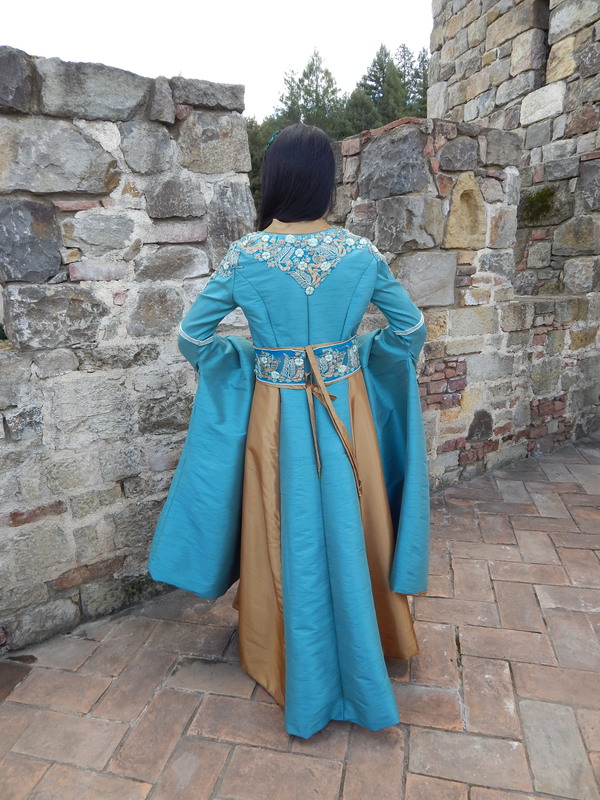 I finished putting the embroidery on my King’s Landing dress and wore it to the event. 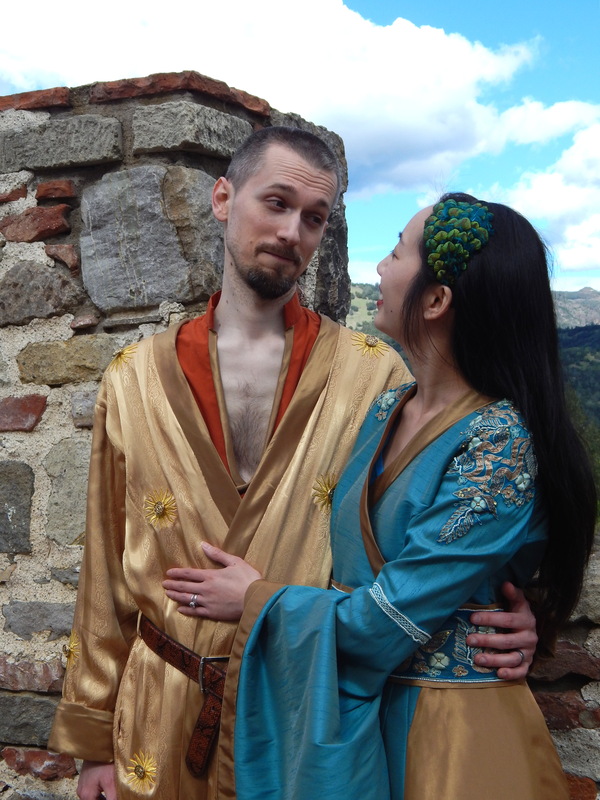 My husband wore an Oberyn Martell-inspired costume I made for him. The venue was really beautiful, and it was a great place to take pictures and have fun. Here is the completed dress, which was made using McCall’s M6940 pattern. 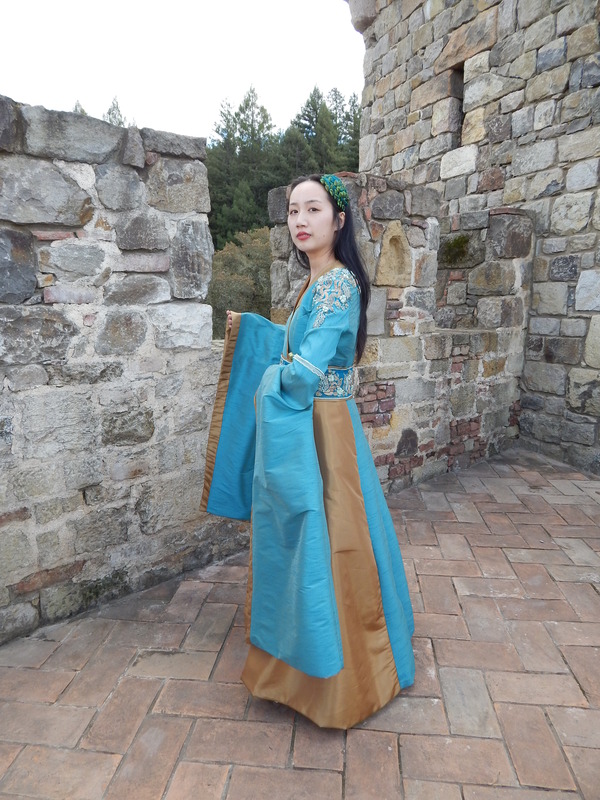 Due to the large amount of yardage in the dress I used faux silk dupioni (teal) and faux silk taffeta (gold). 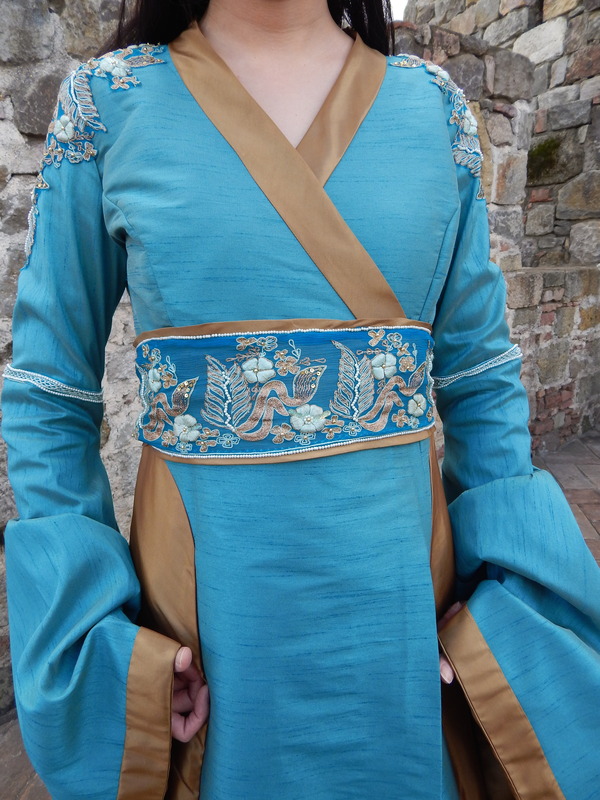 The sleeves are lined in the same gold fabric as the side gores, which were flatlined with random mystery fabric from my stash to give it some body. As discussed in my previous post, I raised the hip gores, added a contrast band around the neckline, and eliminated the ties in the front, but did not modify the pattern much. Oops, my back tie has come undone. The belt and embroidery on the shoulders and back are pieced from an old sari fragment I bought on eBay. The sari had a repeating motif that was not mirrored, so I could not get a perfectly symmetrical design. Instead, I cut up the pieces and rearranged them to get the shape I wanted. The belt was done in a bit of a hurry, freehand, without any measuring or marking prior to cutting or sewing. It’s slightly uneven, so I might go back to it some day. Underneath I wore a lighter gold silk dupioni petticoat that I borrowed from a previous project. The petticoat was mean to accommodate 18th century panniers, so I had to use some safety pins to get it to be the right length. When I have time, I’d like to make a petticoat specifically for this dress. I think the light gold provided a nice contrast when the skirt opened when I walked. I did not have time to make a wig or hairpiece, so I wore peacock feathers in my hair. Here I am on a tower with my husband, and I will discuss how I put together his outfit in a future post. My next post will be some more pictures of the castle, and the other guests! 6 yards of teal faux dupioni + 5 yards of gold faux taffeta: $46.64, including tax and shipping from Fabric.com (Hooray for coupons and sales! I still have 2 yards of the teal left over). 4 yards of sari trim: $31.96 including shipping from India through eBay. (I bought much more than I used because at one point I thought I would trim the sleeves as well). 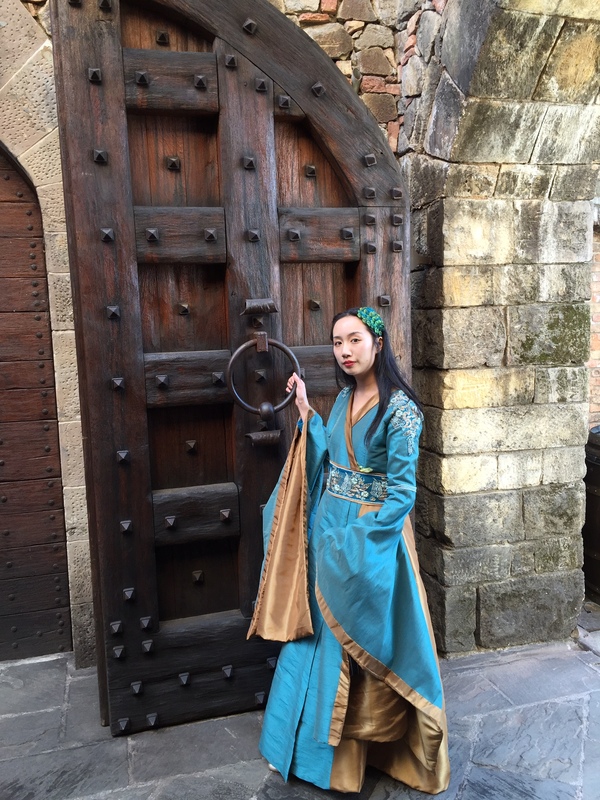 Posted in Game of Thrones and tagged costume, Game of Thrones. Bookmark the permalink. I love it! Looks awesome. Thanks Breanna! I wish you could have been there too with your Daenerys dress! Lovely! The embroidery is such a wonderful touch. Really makes the outfit pop! Thank you Jen! I’m not talented enough to do real embroidery like on the amazing gowns on the show done by Michelle Carragher, but I think the sari embroidery gives it a nice touch! Oh…my…GOSH!!! You are so stunning in this gown!! I don’t think I have ever seen your hair down and it is gorgeous!! WOW!! This whole post just made me smile!! The color of this dress works so well with your complection…job very well done! I love the picture of you and your husband! Laaaaa! Thank you Gina! It was so nice to be able to use my regular hair. Fast and easy! My husband doesn’t normally go with me to costumed events, but he was willing to dress up once he heard there was wine and cheese. This event was so much fun! I hope I get another chance to wear this dress; maybe to Costume College.